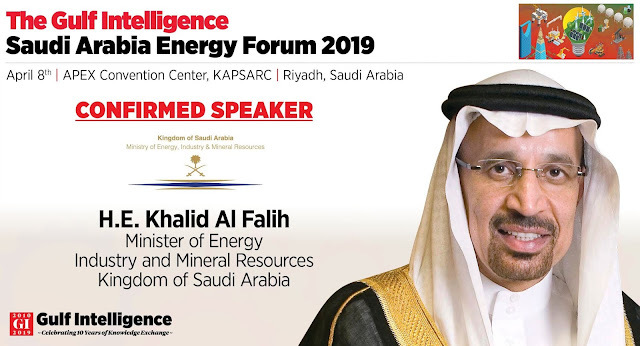 Riyadh, Gulf Intelligence (April 7th, 2019) – His Excellency Khalid Al Falih, Minister of Energy, Industry and Minerals, Saudi Arabia, will provide an outlook for the international oil markets in an onstage interview to be held at the inaugural Gulf Intelligence Saudi Arabia Energy Forum in Riyadh on April 8th. HE Al-Falih, who recently told the OPEC+ group of 25 countries that much more work still needs to be done even though oil market fundamentals were slowly improving since the end of last year, will be the featured special guest at the Saudi Energy Forum which will be hosted by the King Abdullah Petroleum Studies and Research Center (KAPSARC). “The first Saudi Arabia Energy Forum comes at a crucial time in the 4.0 digital transformation of all industries in the Middle East as it has done progressively across the world over the last decade -- with the disruption presenting great opportunities and challenges with staying ahead of the curve or risk being left behind,” said Michael Train of Emerson, which is the Title Partner of the Saudi Forum. “To be successful, energy companies will need clear business objectives, a scalable approach and a comprehensive personnel strategy, including workforce upskilling and tighter collaboration by technology and business operations teams.,” he said. The global megatrends under discussion at the forum will include Cybersecurity, the Future of Work, Climate Change and the Circular Economy amongst others, with industry partners from Honeywell, McDermott, Al Tamimi & Co., Rockwell, Uniper and GE Power providing thought leaders on these subjects to exchange knowledge and best practices with their Saudi counterparts from industry, academia and government. The Gulf Intelligence Saudi Arabia Energy Forum will open with a Gala Dinner on April 7th, hosted by the kingdom’s national mining champion MA’ADEN – the Saudi Arabian Mining Company.